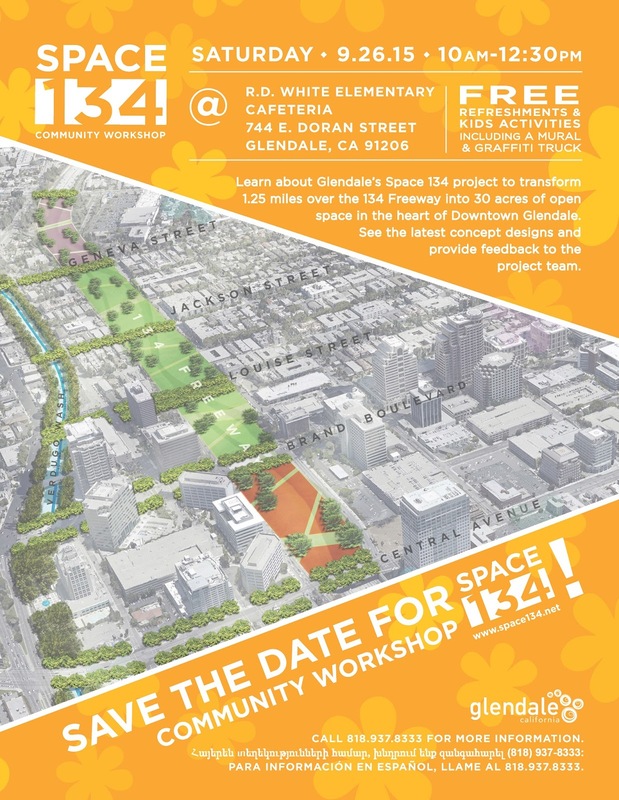 The 2016 Space 134 Vision Plan Update, which is scheduled to be brought up at the February 23, 2016 City Council Meeting, is the result of a series of plans, analyses and public forums which have shaped a more refined look into what a cap park would look like over the 134 freeway in Glendale. If you missed our latest Space 134 Community Workshop this past weekend, here's a summary of the information we covered. Join the Space 134 Conversation! You've heard the all buzz about a Space 134. Now you can learn more about the proposed park project over the 134 freeway and you can share your ideas for the plan. Join us on Saturday, September 26th at R.D. White Elementary School to get all your questions answered and to learn what other people in your community think about the proposed project. Free kids activities and refreshments will be provided. Members of the Glendale business community gathered for a mixer hosted by the Community Development Department at the historic Alex Theatre this past June. Attendees had the opportunity to learn about Space 134 and to share their ideas about the proposed project. If you would like to attend future Space 134 events, please sign up for our e-mail updates and we'll let you know when our next community event is going to take place. You may have heard the buzz about #EarthDay134 this past Mat which was attended by hundreds of Glendale residents who got a glimpse of Space 134 while sharing their vision for the future. Close to 200 people contributed their ideas and suggestions about what they would like to see and do in Space 134.